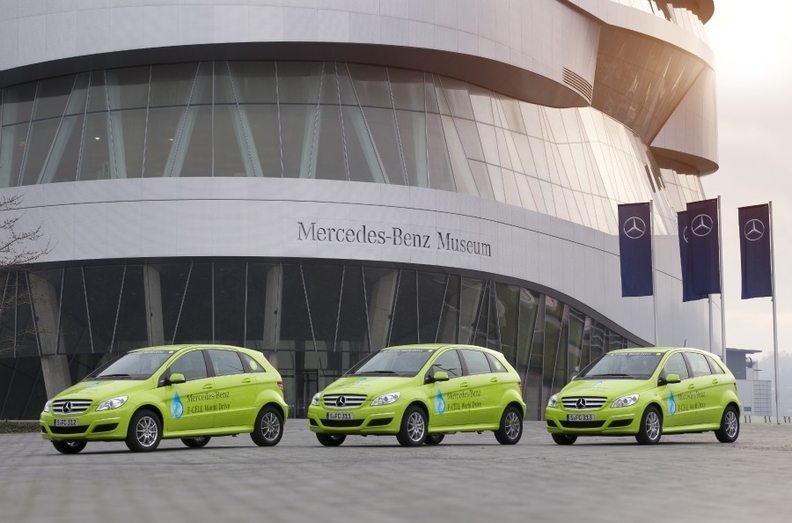 Daimler is sending 3 Mercedes B-class cars on a journey around the globe to demonstrate that fuel cell cars are technically mature and suitable for everyday use. BERLIN (Bloomberg) -- Daimler AG is sending fuel cell-powered Mercedes-Benz compacts on a 30,000km (18,600-mile) trip around the world to steal a march on BMW AG and Volkswagen AG. Former Formula One champion Michael Schumacher and racing colleagues Nico Rosberg and David Coulthard started the four-continent journey on Saturday in Stuttgart, Germany. Three B-class models will head to Lisbon before crossing North America and Australia. The trip then takes them from Shanghai to Moscow and Stockholm before returning to Stuttgart in early June. The display of the fuel cell cars, which don't emit carbon dioxide, is part of Daimler's campaign to highlight its connection with the invention of the first motor vehicles by founders Carl Benz and Gottlieb Daimler in 1886. By leaning on its past, the world's second-largest maker of luxury cars is seeking to to gain an edge over BMW and Volkswagen's Audi unit. The event in Stuttgart, which kicked off a year-long celebration of the German luxury carmaker's 125-year anniversary, was attended by about 1,400 guests, including German Chancellor Angela Merkel. “This unique round-the-globe trip with customer-ready fuel cell vehicles shows that we have sufficient pioneer spirit for at least another 125 years,” CEO Dieter Zetsche said in a statement. The Mercedes-Benz F-CELL World Drive takes in four continents and 14 countries. Daimler is trying to regain its position as an automotive leader after wild swings in strategy. In the '80s and early '90s, under CEO Edzard Reuter, the company sought to diversify into electronics, aviation, and computer services, purchasing electronics company AEG and setting up aerospace unit Dasa. Those efforts were then largely undone under Juergen Schrempp, who sought to create a global automaker with the merger with Chrysler in the United States and the integration with Japan's Mitsubishi Motors Corp.
Zetsche, who ran Chrysler from 2000 to 2005 and took over the top job at Daimler from Schrempp in 2006, handed control of Chrysler to Cerberus Capital Management LP in May 2007. Fiat S.p.A. now controls 25 percent of Chrysler, following the U.S. manufacturer's 2009 bankruptcy reorganization.